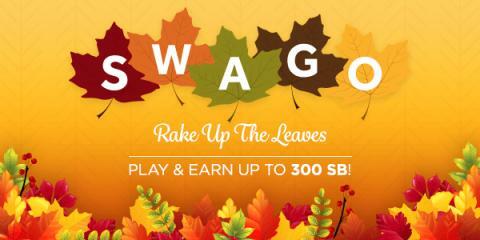 Autumn is in full swing, and Swagbucks is getting into the autumn spirit with Swago: Rake up the Bonuses! What is SWAGO you ask? It's a promotion run by Swagbucks, a website that rewards you with points (called SB) for completing everyday online activities. When you complete a task, watch that square change colors like the leaves of Fall! You can redeem those SB for free gift cards. 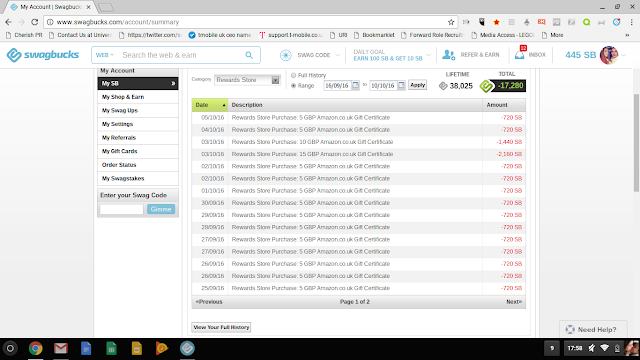 If you've never used Swagbucks, participating in SWAGO is a great introduction to the site, if you'd like to learn more about Swagbucks then you can read my post here. First of all, sign up to Swagbucks! Swago will begin on Monday, October 10th (today! ), make sure you hit “Join” otherwise you won’t get credit for completing the action items. I've been a member of Swagbucks for five years, but have only recently started going back onto the site after rediscovering my love for it! I started back up on September the 16th and in those 24 days I've earned myself £120 in gift cards! Before the full month is over (16th of October) I aim to get another four gift cards, bringing my total to £140 for a month, hopefully I can do it!